A six day training workshop in Ooty. Once the approvals from office came, and the registration got confirmed, I got to the task of booking tickets. I just checked with RedBus if there were private operators - but only some Sleepers showed up. I did not want a Sleeper bus to ride up the ghats. 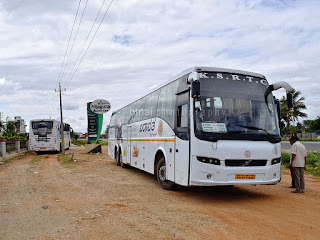 The next option was obvious - Karnataka State Road Transport Corporation (KSRTC). 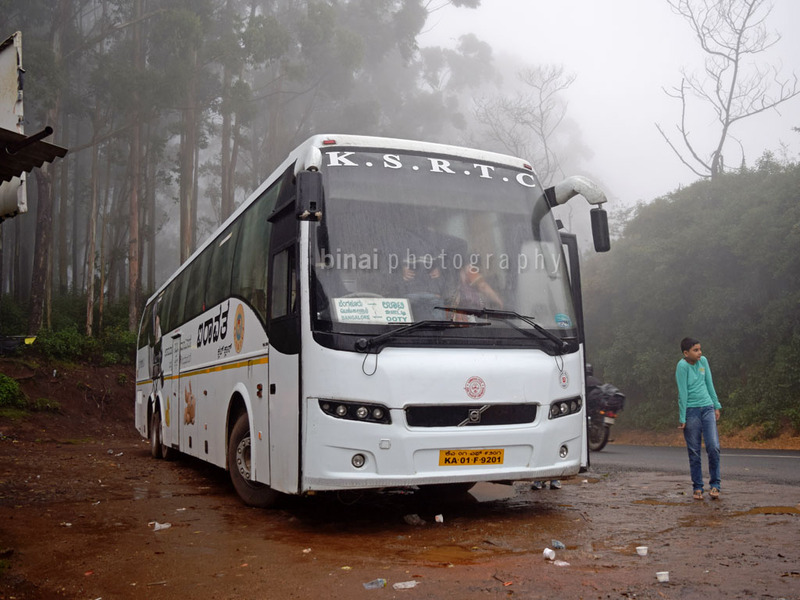 KSRTC operates Volvo buses on this route - both day and night. 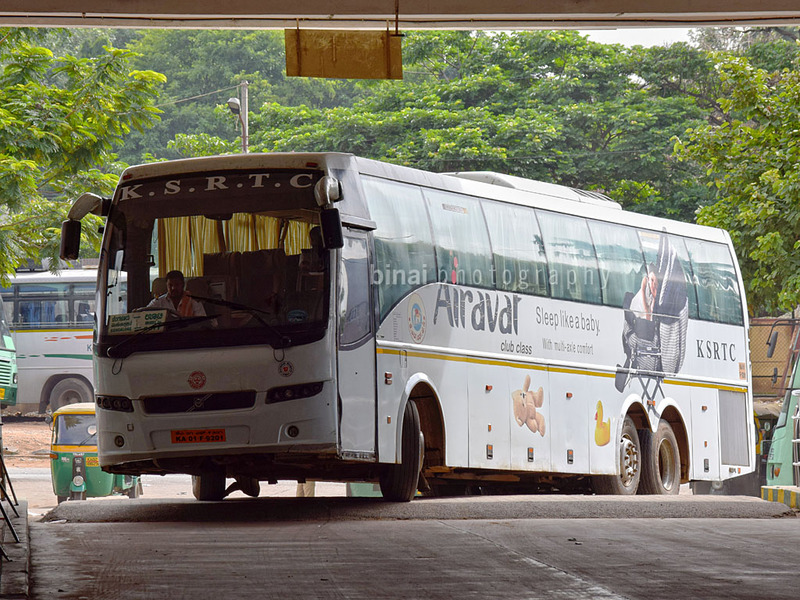 They upgraded some of their services to Airavat Club Class a few months ago, as well. I was always surprised how these Multi-axle buses manage the windy road up to Ooty from Gudalur. Without much thinking, I went ahead and booked both ways on day services. I still had the hangover of the previous days journeys. I got up a little late because of that. After a hurried breakfast, I hunted for an Ola! Cabs were scarce since it was a Sunday morning. After a bit of hunting, I managed to get one, who dropped me at Shantinagar by around 0900hrs. My bus to Ooty was scheduled to leave at 0917, and I was quite surprised to see that the bus was not brought from the depot yet. While waiting, a FlyBus arrived, and later headed towards the airport. My bus was brought in at 0915hrs - with just two minutes to go for departure. The bus was KA-01-F-9201 of Bangalore Central Division, Depot-4 (commonly called as BCD-4 depot). Boarding started a couple of minutes later. 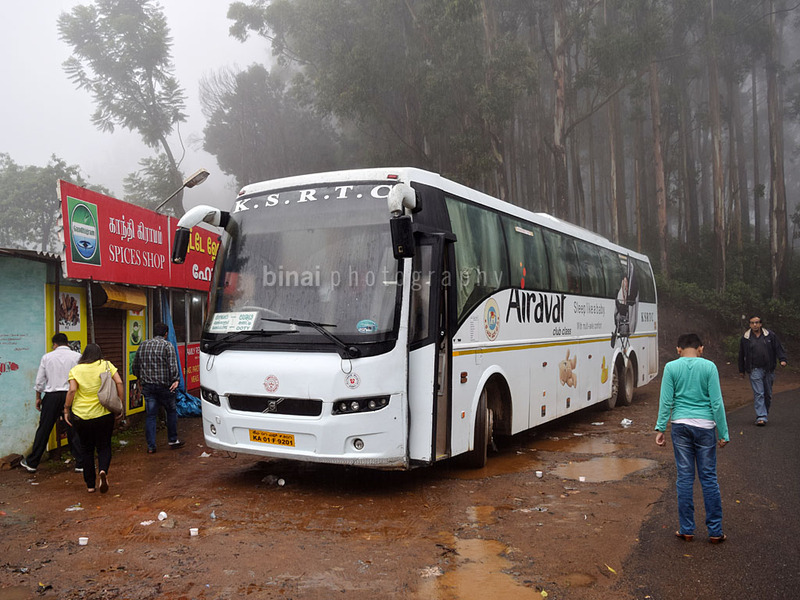 I was quite shocked to see the crowd - we had over 30 passengers to board from there, and most of them were to Ooty. The bus being brought in to Shantinagar BS..
We started off at 0930hrs - with a delay of 13 minutes - from Shantinagar. The first few kilometres were a crawl - till we passed Town Hall. The driver picked up pace after we entered the long Mysore road flyover. The driving was the typical BCD-4 style. Shift 1-2-3-4-5-6 as soon as possible and let the engine struggle, scream and cry for a downshift - the entire bus vibrates as the engine struggles to put out power at low RPMs and high gears. We made it to the Satellite bus station in Mysore road by 0948hrs. A couple of families joined us here, and a the crew managed to get some unreserved passengers to Mysore as well. We crawled out of our platform at 0952, but left the bus station only by 0955hrs. 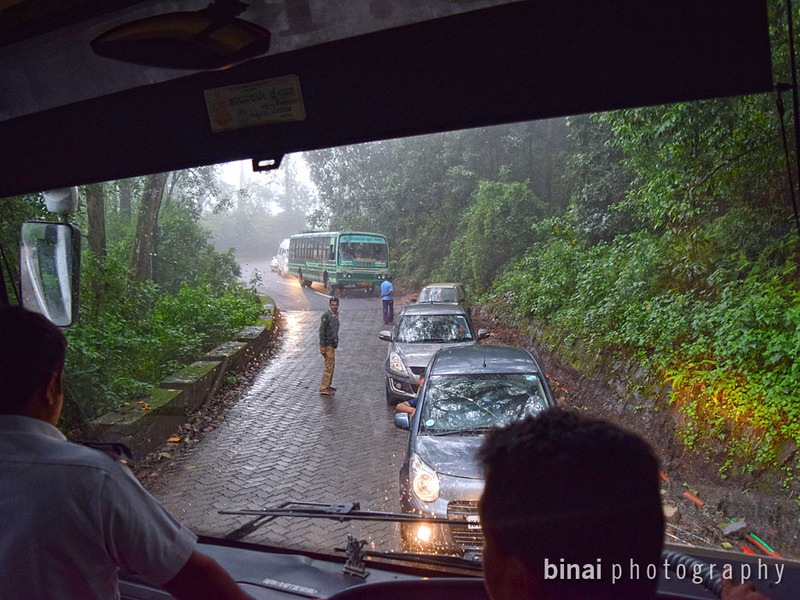 We continued crawling once on the Mysore highway. The crew changed, and the conductor took to the wheels, while the driver headed to sleep for a while. The conductor had the same driving style - he never exceeded 75kmph, but remained in 6th gear all the time. It was terribly boring sitting through all that crawling. Traffic was on the higher side, and we had no opportunity to speed up, most of the time. Traffic came to a standstill as we neared Mysore, especially near the ring road signal. We passed the signal by 1236 and continued crawling to the city. There was more traffic as we neared the bus station, and we finally entered the bus station around 1250hrs. We couldn't pull into any platform due to the terrible traffic inside the bus station. We somehow picked up passengers who had reserved earlier, and managed to get a few walk-in passengers as well. We somehow managed to beat the traffic inside the bus station and exited the bus station by 1309hrs. The driver was back at the wheels now. He picked pace soon after leaving city limits. 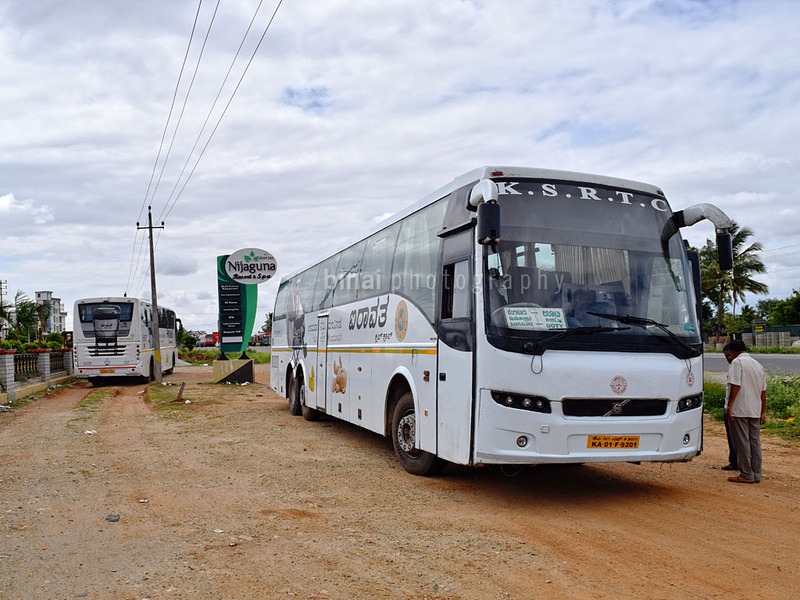 I kept my eyes on the road to find out which bus would be bringing me back from Ooty. I spotted that bus around 1400hrs. We pulled in for our lunch break at Nijaguna Spa and Resorts, just before Gundlupet at 1412hrs. It was a resort - but seemed partly dysfunctional. The place had two restaurants, a bakery and some more stuff - but only one restaurant was open. Bold, yellow boards with "Self Service" was kept everywhere inside the hotel. The billing counter was clueless of what was available and took their own sweet time to collect money and issue tokens. The food was terribly overpriced, quantity was really less and the food tasted very very average. I, at this point, felt Coffe Stoppe where my bus spotted the previous day, was far cheaper and the food better for the price point. After finishing my meal quickly, I headed outside to click some pics. By now the Kozhikode-Bangalore service of KaSRTC also joined in for meals. We started off after lunch by 1447hrs. As we started off, my co-passenger asked the crew about the arrival time at Ooty - he said it will take another 3~3:30hrs. The person quickly added that the scheduled time was 1620 - the conductor immediately replied, the bus has to climb a ghat and the timings weren't considering the ghat section. 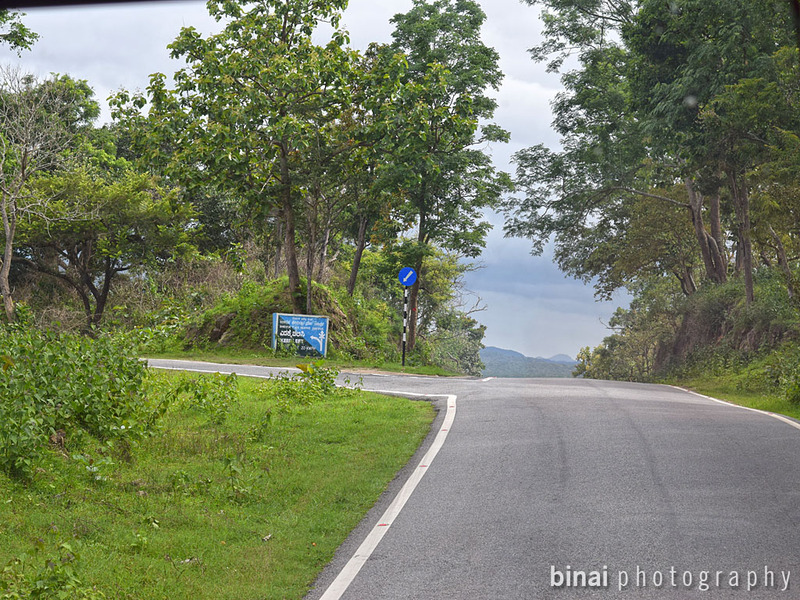 The roads got narrow as we passed Gundlupet and entered the road towards Bandipur. We entered the forest by around 1510hrs. 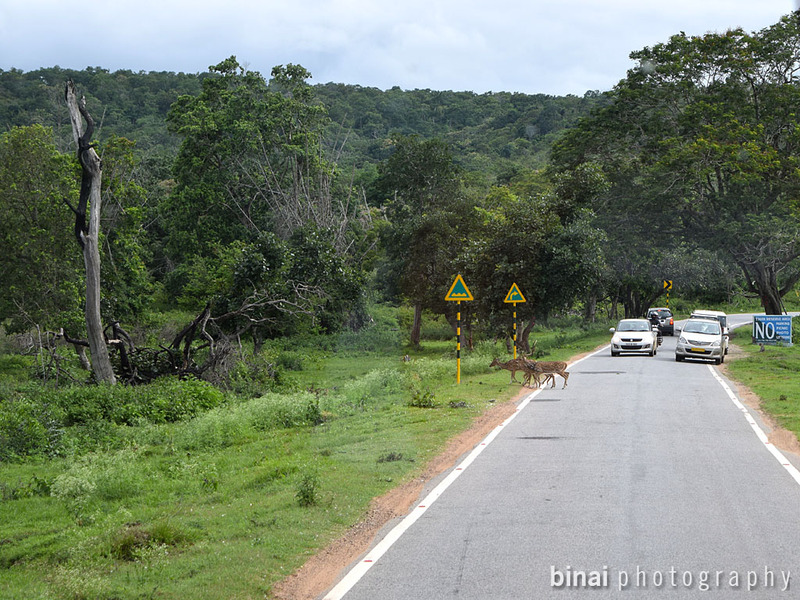 The driver slowed down after he entered the forest - and kept speeds in the range of around 40kmph. There were too many speed breakers and it was not possible to keep speed anyway. There were quite a lot of deer on the road. At one point, one idiot went honking continuously and scared the deer off the road - the cheapest and most idiotic thing to do. 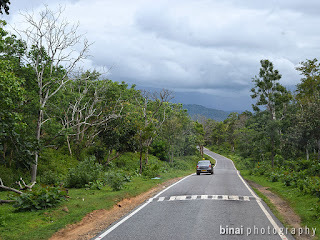 We crossed over to Tamilnadu by around 1526hrs and exited the forest by around 1533hrs. The roads from the KA-TN border to Thorappalli checkpost is now in great shape - last time I went through this road, the road had put the lunar surface to shame. Inside the forest.. an idiot scaring deer.. The ghats.. here we come..
We reached Gudalur by 1600hrs. Three passengers who had to get off here did not bother informing the crew till they passed the bus station and got into traffic. The driver had a really tough time finding a place with enough space to stop the bus and let the passengers get off. In the process we lost some time, and started off only at 1604hrs. Now began the section that I was looking out for - the ghats! 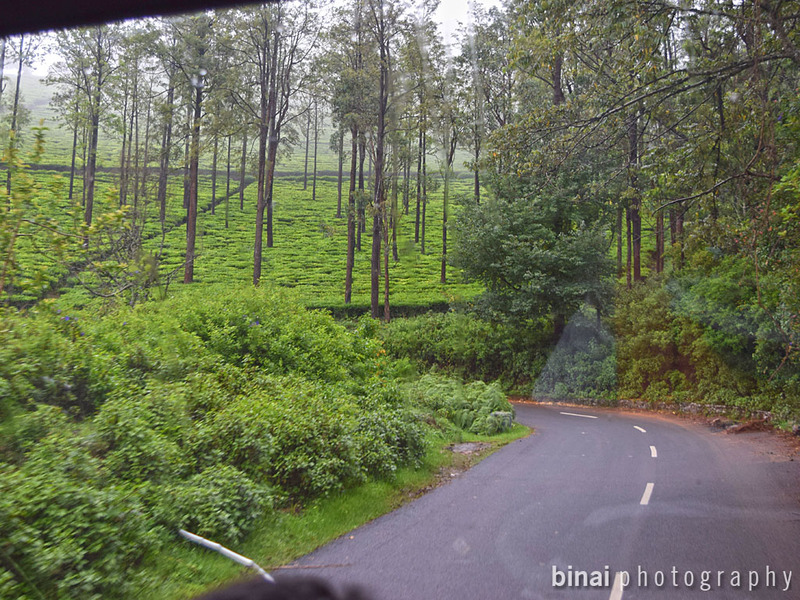 This route to Ooty doesn't have too many hairpin bends (some 3-4 if I remember it right) - but the route is very twisty and curvy. The driver kept downshifting and upshifting many times. Many of the curves were being straightened - they were building new culverts to reduce the curvature. These works meant that the road width available reduced further. When some vehicles refused to respect the big vehicle on a curve.. This bus being longer than the other vehicles, meant the driver had a tough time clearing most of the curves. As we continued climbing, the weather got cooler and the glasses started fogging up. To add to the misery, fog was building up outside as well. The bus did not seem to have a defogger and this kept adding to the misery of the driver. He would often open the door to defog the front glass. As we neared Ooty, fog got thicker. It drizzled for quite some time as well. 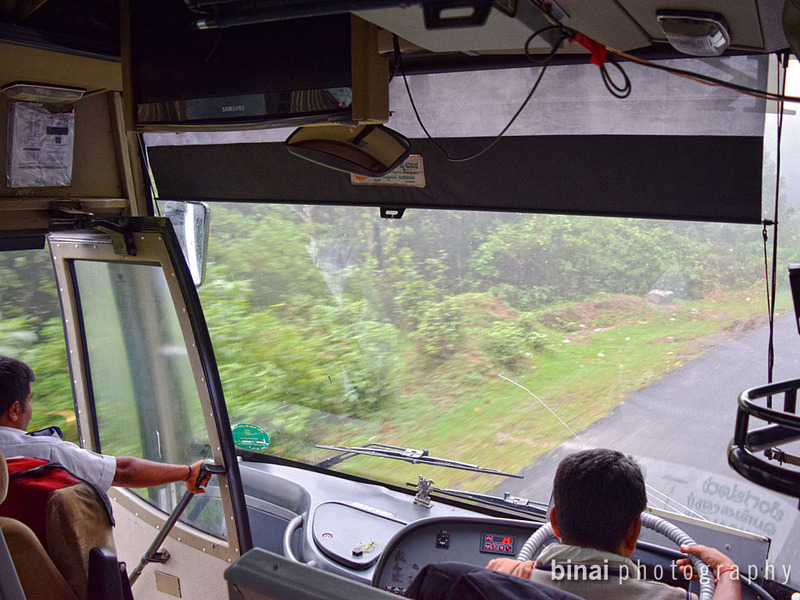 Car drivers seemed to be worst breed on the road - they jump right in front of the bus at every curve and show least courtesy to drivers of these huge vehicles. Downhill traffic was on the higher side, and majority of the vehicles were Karnataka registered, and they all seemed to compete with each other to beat the forest closure time. The natural defogger.. open the door! We pulled in for a tea break a little before TR Bazar, Naduvattam, at 1700hrs. The break was welcome - it was really cold. Hot tea and a fried snack was a great idea! I clicked some pics as well. We started off at 1712hrs and continued the climb. Traffic thinned out a bit as we crossed Pykara. As we neared Ooty, stop requests started appearing. We first stopped at Finger Post (1804hrs). A convoy of KSRTC buses to Bangalore crossed us here - almost all the buses to Bangalore depart together, around 6pm, since they need to cross the forest before 9pm in order to beat the forest travel ban. Traffic was really thick after Finger Post, especially as we entered the town. We finally pulled into the bus station at 1814hrs - about 1h57m behind schedule. The running time was about 8h44m, for a distance of approximately 300kms, of which about 70kms was a nice tough ghat, which took approximately 2 hours to cover. One more pic of KA-01-F-9201.. during tea break.. The bus, KA-01-F-9201, had clocked a little over 9.96lakh kms. It was fairly well kept - not in exemplary condition, though. Both the crew members were soft spoken - the typical Airavat crew! The driving was just average - they lugged the engine badly. Proper gearing would've really got us to Ooty a little more faster - compared to the time they took. The driver refuses to speed up even on empty roads - just to meet KSRTC's fuel saving obsession. While there is nothing wrong in saving fuel, it shouldn't be at the cost of passenger's time. Although the bus was late, I feel the run time was okayish. Water: Yes - 500ml bottles. Will I take this service again? You don't have better options!